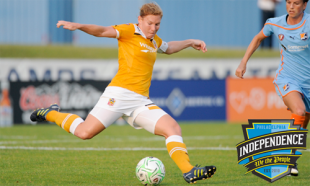 On Wednesday, the Independence finally made official what has been rumored for weeks, that former Atlanta Beat midfielder/striker Lori Chalupny has signed with the team. Chalupny is a former USWNT player who has been capped over 90 times for the senior squad. She captained the Beat last season and tied fellow Philadelphia signing Meghan Lenczyk for the team lead with two goals. Chalupny is a versatile player than can contribute both in the midfield and as a striker. It would not be surprising to see her starting in Vero Boquete’s role in the top of the Independence midfield diamond at the beginning of the season, as coach Paul Riley told PSP last week that Boquete probably won’t join the squad until May (she’s under contract in Sweden). After enduring a difficult season in Atlanta last year where the Beat only scored 7 goals and won 1 game, Chalupny will be hoping for a change in fortune joining the two-time WPS runner’s up Independence. In other big news, it was reported this week that the Independence may be close to coming to terms with USWNT player Lauren Cheney. Cheney played with the Boston Breakers last season and registered 3 goals in 9 games, while also participating in the World Cup. At the World Cup, she scored 2 goals, including the team’s first goal of the tournament against North Korea, as well a goal in the semi-final win versus France. She also added an assist in that match. Cheney is another versatile player who primarily plays as a striker but has also been used on the wing, particularly for the USWNT. She was recently named to the national team’s 20 player squad for Olympic qualifying and will miss time during the WPS season for the Olympics (providing the US team qualifies). If Cheney does sign, the Independence attack will be one of the best in world with Tasha Kai, Amy Rodriguez, Vero Boquete, Danesha Adams, and now Lori Chalpuny all on the roster for 2012. Earlier in the week, it was confirmed that right back Leigh Ann Robinson and left back Estelle Johnson had, as expected, both re-signed with Philadelphia. That leaves only Rodriguez, captain Nikki Krzysik, and Tina Di Martino as players from the starting XI of last season’s WPS Final that have not officially signed with the squad. Riley said that all had verbal contracts with the team and just the final details of their contracts had to be worked out. With a strong core of players returning from last season ,and the additions of some key free agents and quality depth players in the draft, the 2012 Independence is shaping up to be a championship favorite in their third season. Can’t wait for the season to start. The Independence have to be favorites, especially if Marta doesn’t play in the WPS. Chalupny is awesome. Lone bright spot for Atlanta last year. She should operate really nicely as a withdrawn striker or midfield playmaker. Great signing.